Hi, I am interested in your 1957 Jeep Other Jeep Models (stock #CTP1975.1) listed on Autotrader for $19,900. I'd like to get more information about this vehicle and confirm its availability. Worldwide Vintage Autos is pleased to present this 1957 Jeep Willys. 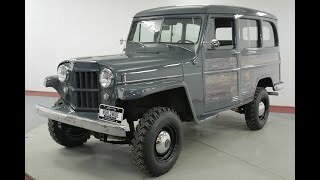 -Rare Jeep Willys 4x4 SUV Split window. -New paint and bodywork. Two tone Gunmetal Grey and Black. -Brand new era correct pizza cutter mud tires. -New best top interior front and rear. -See 28 point inspection in photos.